Hi We are Hokkaido Takarajima offering various types of activities throughout Hokkaido. We are excited to show you different aspects of Hokkaido! 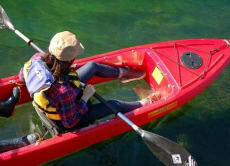 Clear Kayak Tour in Lake Shikotsu from Sapporo, Hokkaido! Snowmobile & BBQ with Taxi Service in Sapporo, Hokkaido! Enjoy Winter Rafting in Niseko, Hokkaido! Hot-Air Balloon Riding in Furano, Hokkaido! Horse Riding Tour with Taxi Service in Sapporo, Hokkaido! For Horse Riding in Wild's Mustang Horse Farm in Hokkaido is the fantastic experience. We went there in late October, the koyo leave is a bit fall but I am sure if we went there in the early October, leave color will be likes paradise. Anyway, there is one big point that I concern is about the no-reply mail from your website that always indicate that my service is included Taxi service that's wrong. I have to contact your staff to clear this point and I receive the explanation that the system is confuse or something. After clear that point with your staff, I am still receive the reminder mail with the same information about Taxi service. So, I wondered don't you fix anything in your system ? I am confuse with the information I received. If you can fix your system up to date, it would be better. 2hr Onuma Marsh Canoe Tour + Teatime! Beginners OK! This was a great canoe tour in the less visited part of Lake Onuma. The guides are very experienced, friendly and give you lots of information about the local wildlife, climate, etc. The backdrop of Mt Komagatake adds a special feeling to this tour. Definitely recommended if you are near Hakodate! An unforgettable experience ! The taxi arrived on time and took us directly to Wild Mustang. Although I was very nervous, the professional staff went out of their way to make me feel comfortable and I was able to enjoy the 60mins course with my niece. First we were given training how to handle the horse - start, stop, turn right/left, zig-zag and moved on to trotting and galloping (if you wanted). Afterwards we started the trek and was able to admire the great view on horseback. My niece was having so much fun she didn't want to stop riding, so she booked for a further 30mins there and then and the taxi waited for us. You can borrow hats/gloves and boots. You can buy carrots to feed the horses and I made sure my horse got well rewarded with lots of carrots. This is a great outdoor experience for all ages and all horse riding level. Before I booked, I had many questions to ask, so there was a lot of email back and forth, but once I booked it was plain sailing.